When kids get sick, they deserve the best health care can offer — the best treatments, the best doctors and the best researchers searching for new medicines and cures. That’s why so many parents bring their children to us. With some of the country’s leading specialists and researchers, our pediatric team is focused on bringing the latest research and most innovative treatments to patients. Families come to the University of Florida from across the state and country for the type of care offered here. UF has one of only a few centers for proton beam radiation in the country, a congenital heart disease center and experts in glycogen storage disease, pediatric surgery and diabetes, to name a few. But a piece of the puzzle is missing. UF needs funds for pediatric programs, new equipment and endowed professorships, which give researchers more time to focus on research or teaching, laying the foundation for advances in children’s health care. And most importantly, our smallest patients need their own hospital, a place where the doctors understand their physical ailments and realize growing up is hard enough to do without worrying about a health problem. 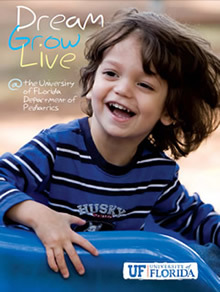 Consider donating a gift to the Department of Pediatrics at the University of Florida. Help educate the next generation of pediatricians, advance children’s medical research or help build a new facility. Read the Dream, Grow, Live publication for more details. For more information please contact the UF&Shands Office of Development at 352-265-7237.